The work week begins — for those who haven’t headed to the beach for the last week of August — with the Moon in rip, roarin’ Leo. Find a way to shine — and help others, shine, too. Party on, dudes! Make way for drama kings and queens! The Leo Moon cruises without much interference for the next three days. If you’re feeling emotionally buffeted, you can’t blame it on the ups and downs of tense aspects from other planets to the Moon. You can take advantage of a steady flow of lunar energy driving the day and work without distraction. Or play to your heart’s content if you are beaching it. Venus leaves Virgo for Libra — one of her home signs — at 10:07PM ET. This is generally a happy occasion, as the planet referring to social expression, women, art and money is well-supported by Libra’s people-pleasing need for beauty and balance. It facilitates being less of a Venus in Virgo critic, more of a diplomat with social graces. At 0 Libra, Avid Readers will note that Venus is thus at the Aries Point, so we can expect matters of women, money, values, beauty to be especially prominent for the next day or so — with a spin on what is fair and just — or just right (for stories crossing the wires with Virgo at the very end of Virgo). Re: “just right” — here’s an apt piece on how women aren’t buying from certain retailers who persist in offering bad clothes. Here’s one about a woman in Australia making headlines for replacing her mugshot with a more flattering photo. Really, why is this making news NOW? Mercury—which in the language of astrology refers to mindset, travel and communication—will appear to move backward through the sky until September 22nd. It’s not really moving backward, but that is how it looks from our perspective here on Spaceship Earth. Mercury goes retrograde 3-4 times each year, for a period of 22 days. This Mercury retrograde happens at 29 degrees of Virgo, suggesting that whatever is up for REview and RElaxation likely involves discerning analysis about an issue’s practical service and cooperation. If you have a planet or angle around 29 degrees of Gemini, Pisces, Sagittarius and especially Virgo, you are more personally affected by this particular Mercury retrograde. If you don’t have a planet on those degrees, find out what house in your horoscope 14-29 Virgo falls. That’s is the area of your life now up for REview. As I have written in prior forecasts, the end of this week features a New Moon in a tense pattern with Saturn (real) and Neptune (unreal), similar to what we experienced the first week of June. Except this New Moon (in Virgo) will be an eclipse. There is no need to run screaming down the halls. More on that later this week. Your Moon voids for the week: Wednesday 12:20AM ET until 11:22AM ET; Friday 6:13PM ET until 8:55PM ET. Sunday has a long one: 8:30PM ET until 8:38AM ET — but shouldn’t be too challenging for folks in the Americas. Moon voids — during which the Moon wanders without much focus — are apt for taking care of routine matters — and rolling serenely with whatever twists and flakes may derail efforts to move forward in a straight line. I leave you with this image of senseless beauty, suitable for Venus at the Aries Point — on its way into lovely Libra. I buy these wildflowers for five bucks at the local farmers market — a fresh bouquet each week. They remind me of summers spent in Maine during my childhood. 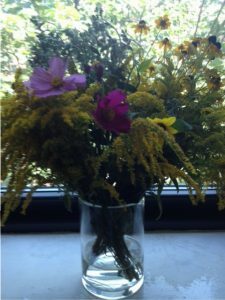 Much gratitude to Avid Readers Diane, Earleen, Teri and others, whose combined efforts enabled this month’s flower fix. When I gaze at these flowers, I think of you. Too pretty to keep to myself — may their beauty brighten your day! UPDATE: Here’s a link to the Flower Fund, since an Avid Reader kindly asked. More gratitude!